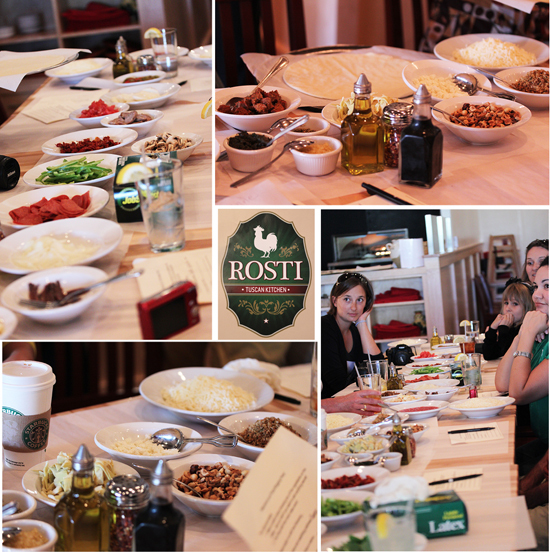 Recently I received an invitation to join in a visit to Rosti Tuscan Kitchen in Encino, CA, along with ten other LA food bloggers, for a pizza-making competition. The invite said Rosti would provide the rolled-out dough and a slew of farm-fresh ingredients, and we’d each get to make our own fabulous pizza creations. These would be baked up, judged and voted on. And (trumpet salute) the winning pizza would be featured on the restaurant menu in the Santa Monica and Encino restaurants along with the name of the winning blog. Well, how could I pass this up? 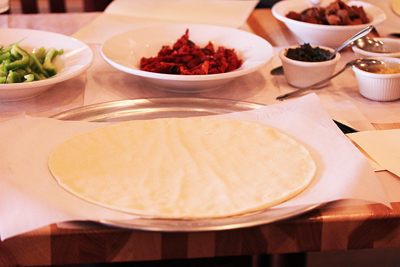 Pizza, an afternoon with my blogging friends and a friendly contest. I’m so there! 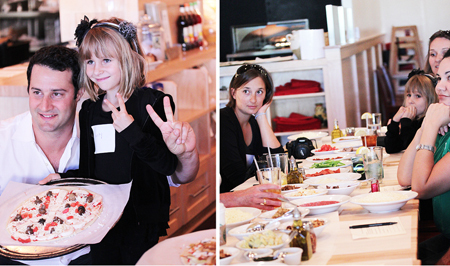 We were welcomed by the owner of Rosti, Kevin Goldfein, and seated at a long table in the dining room, as you can see in the photos above, which was covered with bowls of all the ingredients we could use to build our pizzas. Wonderful things like artichokes, anchovies, sun-dried tomatoes, pesto, minced garlic, meatballs, mushrooms and kalamata olives. 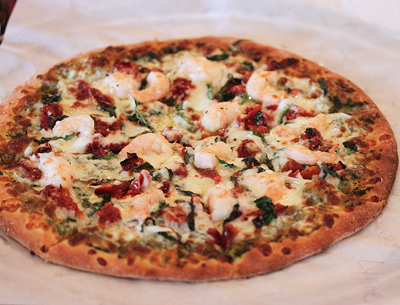 I had no idea what I was going to put on mine, but I have a shrimp pizza I like to make. But I saw no shrimp. Darn. Kevin explained that each of us would be supplied with a dough-round and when all were constructed, they would be baked and we would each get a small piece of each pizza. We received a ballot to record our first three choices, which would be counted at the end. If we didn’t see an ingredient we would like to use, we could ask him if the kitchen could provide it. Here is my blank canvas. I had no clue what to put on it. So I decided to ask if they had shrimp…and they did! 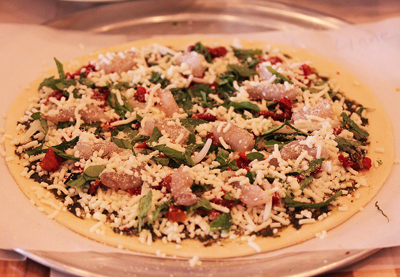 Here is my pie, pre-baking, with pesto, shrimp, sun-dried tomatoes, basil, arugula, mozzarella and parmesan. We put our pizzas on a table to wait for everyone to finish. Meanwhile I checked out Rosti’s menu. 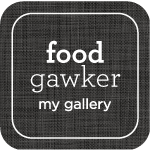 Wow, they have every Italian category possible: starters, appetizers, starter salads, soups, panini, sandwiches, hearty salads, pasta dishes, chicken and fish dishes, calzones and a kid’s menu. And PIZZAs. 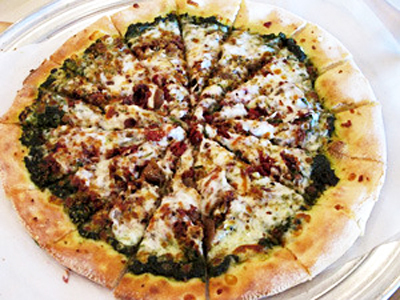 They have the standard combinations, but they have some that are definitely not your grandma’s, like The GCOP~ Goat Cheese, Caramelized Onions & Crisp Pancetta; and Pesto Hazelnut Pie~ Fresh Mozzarella, Cherry Tomatoes, Hazelnuts and Pesto. Plus you can build your own pizza from a list of 26 different ingredients! And here is my pizza after baking. Meanwhile everyone was busy constructing their pies. Here on the left you can see Kim of Rustic Garden Bistro, whose main ingredients were anchovies, sun-dried tomatoes and balsamic vinegar. 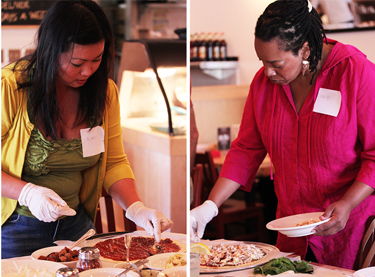 On the right is Cheryl of Black Girl Chef’s Whites applying chicken, Italian sausage, pesto and caramelized onions. 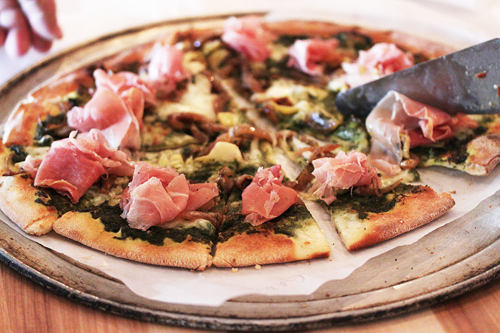 I thought the most photogenic pie was made by Gaby of What’s Gaby Cooking, with artichokes, pesto, caramelized onion and a twirl of perfect pink prosciutto on each piece. On the left is our host, Kevin, and Minty, holding her mushroom, marinara and mozzarella pie. On the right is Gaby of Whats Gaby Cooking, Minty and her mom, Lucy, of Ladles and Jellyspoons, and Paulette of Girl+Fire. And the winner is Paulette of Girl+Fire !! and her pie adorned with pesto, mozzarella, pancetta, caramelized onions, sun-dried tomatoes, bread crumbs and a honey-balsamic drizzle. I voted for this pie as my first choice. It was so good. In fact, it is on the menu at both restaurants this week, if you’d like to taste it also. 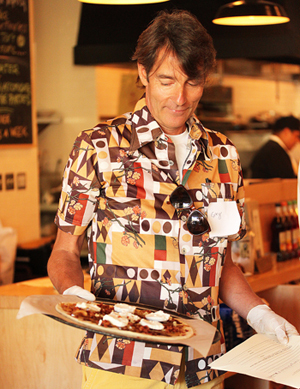 And second place went to Greg of SippitySup for his pizza with caramelized onions, goat cheese, pancetta and balsamic vinegar. Yea, Greg! The third place winner was Lucy of Ladles and Jellyspoons for her butternut squash, gorgonzola, mozzarella and sage pie. Doesn’t that look delicious? Here on the left you can see Greg of Sippitysup and Pam of My Man’s Belly waiting for the pies to be baked. Pams pie featured marinara, meat balls, pepperoni and mushrooms. What a great combination. Yum. On the right is Erika of In Erika’s Kitchen and Kim of Rustic Garden Bistro. Erika’s pie was adorned with figs, goat cheese, bacon, olives and rosemary and it smelled so divine! Sitting next to me at the table was Mr. Rustic Garden Bistro (aka Barry). As we were served a little slice of each pie, Mr. RGB took one big bite and then carefully placed the slices in perfect layers around his plate. What kind of clue is this about you, Barry? 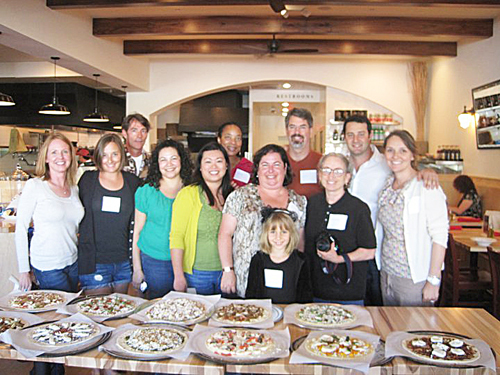 And here is our group, photo courtesy of Rosti Tuscan Kitchen. I was so stuffed with pizza. Together, the eleven of us polished off eleven pizzas. Groan. 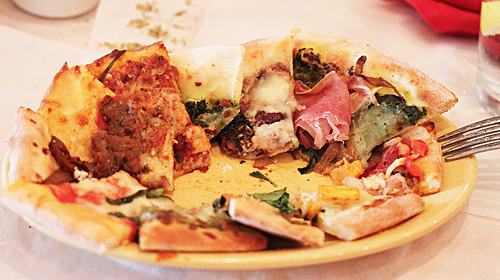 Those pizzas were so delicious… every one really was a winner. Thank you all for such a great event! By the way, Rosti Tuscan Kitchen recently started offering gluten free and vegan menu items… and a monthly pizza contest, which you can find on the Rosti Facebook page. If you win, you get free pizza for a year! What a fun event! I don’t know what i would love more…getting to make a pizza that good, or getting to taste everyone else’s! It was indeed a LOT of pizza to consume, but it was so much fun. Thanks for voting for my pizza! I’ve been to Rosti three times this week to accompany friends and family who wanted to taste the “winning” pizza. It’s a little different from the one we had, but interesting and yummy nonetheless. 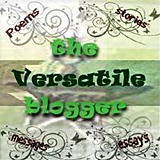 I encourage everyone to “like” Rosti on Facebook and take part in their new contest. Develop your own winning pizza and garner the same prize: a featured Pizza of the Week slot AND free pizza for a year! I would be so nervous to do this! I think they all look fabulous, however. Really delicious! 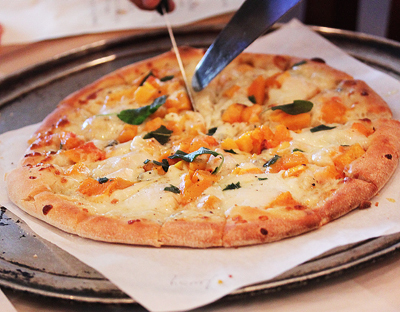 I do love the sound of that butternut squash pizza…what an amazing event you were able to attend! I would love to be able to go and “paint” on my blank canvas. How much fun (but also a bit intimidating, I’m sure!) All of the creations looked delicious. I would have gladly sampled each and every pie! That event was a lot of fun. BTW…I voted for your pizza. I really liked the shrimp on there. Your pictures turned out really nicely. Mine were a disaster, so I’m a bit jealous. This looks like too much of a good thing when you’ve got portion-control issues like me. Yum! I actually like the sound of that butternut squash one (and it’s the only veggie one), but they all sound wonderful! Sounds like it was a great event. You were in great company.